The short-beaked common dolphin is a hydronamically designed pelagic delphinid and one of 30 neritic marine animals listed as an indicator of climate change. The CRU Gibraltar is an umbrella division of the Unit working with common dolphins (Delphinus delphis) in the clear Mediterranean waters lying between Europa point on the Rock and Punta Carnero in Spain in the Bay of Gibraltar. Gibraltar is one of the Pillars of Hercules and is an impressive site at the entrance to the Mediterranean Sea. From time immemorial it has been given military strategic importance, but in this day and age its importance is being guided by a more environment-orientated and naturalistic focus. 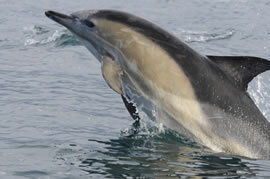 The common dolphins in the Bay of Gibraltar form an integral part of the natural heritage of this area. For as long as folk can remember, the dolphins have been present in the bay. Yet until comparatively recently -- with the advent of dolphin-watching in Gibraltar -- these animals have received very little attention. Today, however, the resident dolphin using the bay enjoy a much higher profile as the result of the growth of this industry, though purely in a commercial sense as they are now responsible for the income of a great number of families. It would seem logical that the well being of these animals should be of primary importance to those who depend on them for a living, and to the government who depend on them as a tourist attraction, but ironically the dolphin watch industry is becoming a major source of disturbance for the animals; as the Gibraltarian government continues to issue commercial licences to boats in the absence of any control over how these businesses operate. In addition to dolphin-watching, these animals also face an ever-increasing number of ships bunkering in the bay and of commercial and recreational maritime traffic - increasing the risks of potential boat strikes and disturbance by direct harassment. Add to this the effects of industrial and domestic pollutants, over-fishing, habitat change and entanglement in nets. The list goes on. The CRRU's Gibraltar group aims to address these and other anthropogenic affects which may seriously affect the lives of the animals in this area. to monitor the status/health of these and other coastal cetacean species using the study area in view of management options for their future protection. The data yielded by these studies will add greatly to our knowledge of the distribution, ecology and dynamics of the common dolphin populations using the Bay of Gibraltar: the number of resident or transient animals frequenting the area from one season or one year to the next; the group structure, mean school sizes and mean number of calves in the population; and the social interactions, behaviour, densities of animals and their site fidelity, for example. Perhaps most importantly, the information provided by these studies will be instrumental in the formulation of effective conservation policies and management proposals to protect this dolphin population and the marine environment in this area of the Meditterranean Sea. By broadening the geographical range in which this species has been studied, the CRRU's Gibraltarian-based team will also help to develop a more general understanding of the factors influencing the distribution patterns and success of these and other small, coastal cetacean populations in Mediterranean waters. In this respect, the importance of environmental conditions, anthropogenic factors and food availability in the Bay will also form primary considerations for the group.